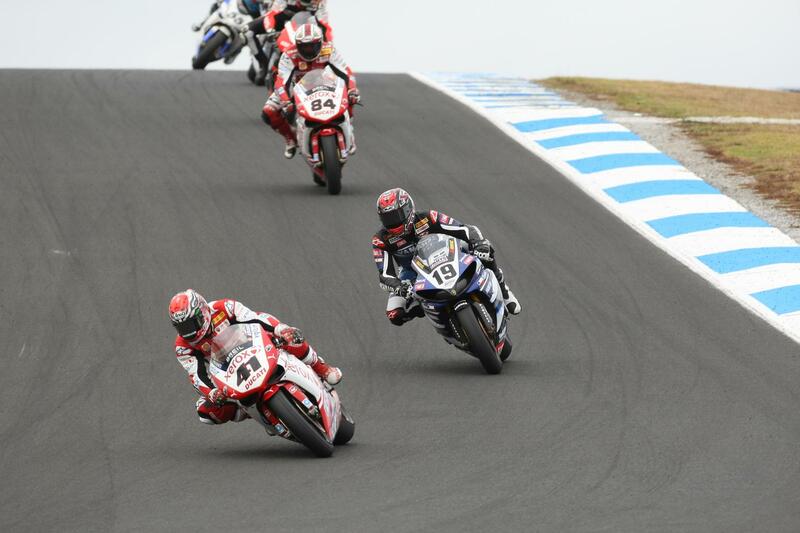 Ducati rider Noriyuki Haga and WSB rookie Ben Spies took a win each at the opening round of the season at Phillip Island. Haga made his intentions for the season clear by taking the win in race one after Hannspree Ten Kate Honda rider Jonathan Rea led early on. Haga got off to an amazing start, finding himself second on the first lap, despite qualifying in 13th position. Haga easily despatched Rea to take the lead, but he was soon followed by Suzuki rider Max Neukirchner. Neukirchner and Haga battled at the front, with Haga choosing to follow Neukirchner for several laps after the Suzuki rider overtook him. Not till the final lap, after light rain started to fall was Haga able to make a move stick. Neukirchner had a big rear end slide at the top of Lukey heights enabling Haga to comfortably move in to the lead to take the win. Haga said: "First of all I want to say the qualifier wasn't so good because I don't like this new system. The start was fantastic. Me and Max had a good battle but the conditions were quite nervous and it started raining so it was difficult." Ben Spies was unable to run at the front in race one after being forced off track at the first corner. Spies managed to finish 16th. Rea was the top Brit, finishing fifth with Stiggy Honda rider Leon Haslam sixth. Tom Sykes and Tommy Hill finished 10th and 14th respectively. Shane Byrne retired after seven laps. BMW rider Troy Corser had an impressive race on the new bike, finishing eighth. Team-mate Ruben Xaus finished 19th. The new Aprilia team had an equally impressive race as ex-MotoGP riders Max Biaggi and Shinya Nakano finished 11th and 15th. Yamaha rider Ben Spies bounced back from his disappointing race one result to comfortably win the second race. Spies managed to get a good start to stay clear of the middle of the pack which saw him run off in race one and from there he showed impressive pace. Only race one victor Haga could challenge Spies. Spies (USA), said: "The race was really tough and we tried to break away a couple of times but couldn't. When their tyres went off I just got to the front and put my head down. "It was a hard race but very fun. I got caught out in the first race but we regrouped and in the second race we kept the pace high." Haga and Spies pulled away from the chasing pack of Max Biaggi, Michel Fabrizio, Leon Haslam and Regis Laconi. Biaggi looked the favourite to take the final step of the podium but was passed by Haslam and Fabrizio in the final stages of the race. Biaggi crashed on the final lap after he almost ran in to the back of Fabrizio. Leon Haslam was the top Brit, riding impressively to finish third. Haslam said after the race: "Credit has got to go to the team. Three months ago they were only just building the bike. There was a bit of argy bargy with Fabrizio today, but that's what WSB is all about." Rea, Sykes and Hill rounded off an impressive weekend for the Brits finishing ninth, 10th and 14th. BMW and Aprilia, the two new teams for 2009 weren't able to repeat their impressive first race results. Xaus and Corser finished 11th and 22nd, while Nakano and Biaggi finished 12th and 15th.